Helping others is always in style! return to Argentina with 10,000 pairs of shoes made possible by TOMS customers. I asked my friend Allison why she loves her Toms and she said, “They are comfortable, easy to slip on, and you can wear them with just about any outfit year-round.” Allison owns the brown burlap, black glitter, and black ones with white writing all in the original style. There are many styles of the shoe now, but in the beginning there was just one simple style which happens to be the one I see the most around campus (typically in the 40-60 dollar price range). This style can be worn with anything from jeans or slacks, leggings, and even casual dresses. Both men and women seem to love the simple style and laid-back feel of TOMS. The new styles include wedges, boots, ballet flats and even more. There are even pictures of couples in their TOMS on their wedding day! However, not everyone is a fan of the look of the shoes. If you are one of these people, but still want to help out, there are other ways to do so! TOMS is getting bigger and expanding its market with scarves, hats and even sunglasses. As far as the sunglasses go, if you buy one pair, eyesight will be given to someone in need. This may sound crazy, but with the purchase of the sunglasses, either medical treatment, eyeglasses or sight-saving surgery will be given to someone who cannot afford it. The glasses are in about the $135 range but are great quality, and giving someone else the gift of vision is truly priceless. So just remember: whatever your fashion sense is, helping others is always in style! 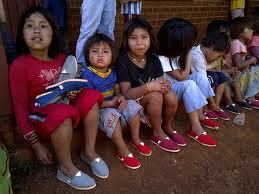 I’ve never been much of a Toms guy, but I do appreciate the services their company provides those in need. This reason alone would influence my purchase of any Toms-made product. Great post, though! Keep up the good work. I’ve heard about this story in my communication class. I think what Blake Mycoskie is doing is great. Its good to know how people want to make a change in the world and are taking it upon their selves to do so. Instead of waiting on someone else to take action. I don’t personally wear Toms but I will buy some just for the cause and to try and switch up my style a bit. I really liked this post about the haircuts! I’ve been wondering about them all week long! I think that the picture adds something great to the blog post as well. Keep up the fabulous work! When Toms first arrived in Nashville, I wasn’t a fan…of the shoes that is. It is for a wonderful cost and a great thing to take part in, I just never saw myself wearing a pair. However, as time went on, the shoes grew on me. I saw a pair back when I was Christmas shopping and have now been looking for that one particular pair for about a month now but can’t seem to find them again. Hopefully here in the next few weeks, I will come across them and make the purchase; a purchase for my feet and a purchase for a very good cost.